Cool embroidered camo paw print sling bag has a single paw print, which is stitched in a camouflage pattern. Very cool, excellent for the military or anyone that just loves a good camo pattern! Other color combinations are available in this design, including blue urban, pink urban, and more. Shown is green Woodland Camo. 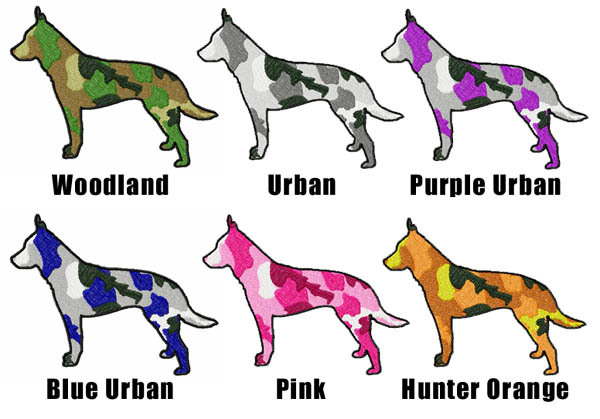 View available camouflage colors here: Camo Colors. Approximate embroidery area is 4″ x 3.8″. Thread color will vary slightly with your chosen color. To request specific colors, please use the Personalization Box at the right, above the “add to cart” button. This item is made when it is ordered. Therefore, please allow 3-5 business days for creation before shipment of your item(s). This cool embroidered dog bag has a grunge style skull and crossbones on the pocket, with a bright pink bow on the dog’s head. Very unique dog lover gift will appeal to young adults and teens. A beautiful piece of mola dog art, showing a brown pooch jumping joyfully through a green meadow with colorful flowers. Overhead, sun rays and a pretty blue sky complete this scene of simple joy. Unique dog lover bag available only through Inky Dinky Dax Designs! Cool, modern embroidery of “Dogs Leave Paw Prints On Our Hearts.” This design consists of a heart stitched in the center, with paw prints running across it. Single color design – you can can pick the thread color! A dog lover’s yin yang is the “pawfect” addition to this groovy embroidered sling pack. In the center is a yin yang, using paw prints instead of dots. A wonderfully unique addition to any pet owner’s collection. This modern and cool embroidered pawprint sling pack has the paw print is in the center, and coming from behind it are swirls and streaks of a unique tribal design. Awesome native design is offered in a variety of color combinations on various sling pack colors.